Spin This: "Ain't Nobody (Gonna Turn Me Around)," "Dr. Feelgood," "Rock Steady," "Spirit in the Dark (Live)," "Pledging My Love/The Clock"
Good value for your buck. All the Atlantic favorites abound here. Assembling a box set on the Queen of Soul isn’t exactly rocket science. This is especially true if you’re only delving into the soul vaults and factory of Atlantic Records, where Aretha Franklin recorded the lion share of her critically-acclaimed hits. The Queen of Soul, a Rhino-sponsored four-disc clover, tries to stuff all of the rewarding moments of Franklin’s career with Ahmet Ertugen’s institution dating all the way back to her 1967 debut LP, I Never Loved a Man the Way I Love You. The eighty-song showcase stretches to 1976’s Sparkle, ignoring the three overlooked discs predominately produced by Curtis Mayfield, Lamont Dozier and Van McCoy. For avid Aretha collectors, this set is simply a recycled repackaging. It’s merely a complete portrait of Franklin and hardly showcases the ups and downs of her artistry. 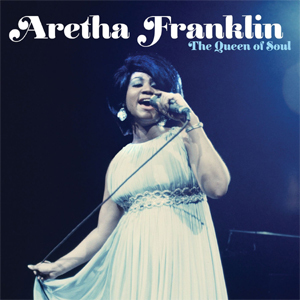 But for those who are looking for only the best – or simply a longer set list than the perfect one-disc compilation of 2001’s Aretha’s Best (but minus the Arista stuff), then The Queen of Soul will deeply satisfy. All the heavyweight material of her golden era is here (“Respect,” “Dr. Feelgood,” “Like a Natural Woman,” Think”). There’s also a rousing abundance of B-sides and album classics (“Pledging My Love/The Clock,” “Don’t Let Me Lose This Dream,” “Satisfaction,” “Ain’t Nobody (Gonna Turn Me Around)”) tucked inside, so are her revered gospel sides (“Mary, Don’t You Weep,” “Climbing Higher Mountains”). Outtakes run amuck including the Memphis dry-rub blues of “Talk to Me, Talk to Me” and a soaring soulful take of the crooner classic “My Way.” The set is missing a few important gems, like her spiritual remake of Marvin Gaye’s “Wholy Holy” and her rocking percussion soaker “Jump” from the Sparkle soundtrack. These are light quibbles. The loudest of them would be the lack of any liner note content and the bare minimal of tough packaging for the Royal Highness. But with a budget-friendly price tag (under $30 in select retail) and a light update on 2009’s Queen of Soul: The Atlantic Recordings four-disc box set, it’s hard to make angry faces at the set without first giving a smile to the trusty wallet.